Do your users wait hours, days or longer for new apps to be installed? Reduce that to minutes with seamless, self-service, automated software delivery from ServiceNow's software catalog. Integrate directly with your Microsoft System Center Configuration Manager 2012 (ConfigMgr / SCCM) infrastructure to import existing software library items into ServiceNow. Users benefit from an integrated app store experience with one-click installation of software from their service catalog. Installation is performed natively and automatically by the integration with Configuration Manager and begins immediately with no need for manual administration. A common challenge we face as IT operators is software: how do we provide users with the applications they need to be effective? Users want to get new software with as little friction as possible and expect a consumer app store experience. At the same time, the business and IT need to make sure software is supportable, configured consistently, that license costs are managed, and that security isn’t compromised. There's also the management aspect: how do we provide simple, robust capabilities for approvals, notifications and reporting? Support staff and business management don't want yet another interface/tool to learn and maintain. They want an integrated experience. 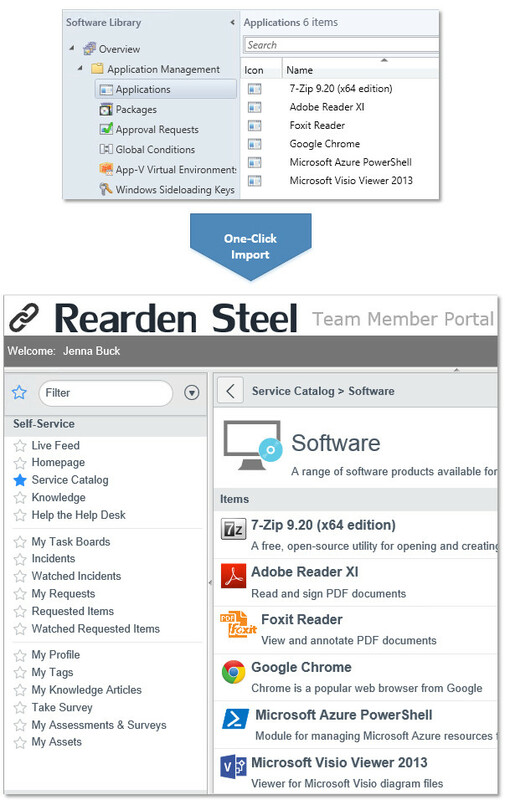 Users know where to look first when they need something, including software: the organization's internal portal. Admins already have a means to deliver applications: System Center Configuration Manager. The problem is a gap between request and delivery, typically bridged by human hands fulfilling software requests through manual, tedious administration tasks which drain hundreds or thousands of hours from a team supporting a large user base. But this gap can be bridged much more intelligently through automated integration. ServiceNow and System Center Configuration Manager offer great platforms to tackle this challenge, and this integration leverages the best of both. Initial setup can be completed in under an hour. It doesn't involve changing anything in Configuration Manager beyond granting very limited access to a service account. Other solutions or custom integrations rely on complicated and potentially custom integrations involving third party software or licensing. 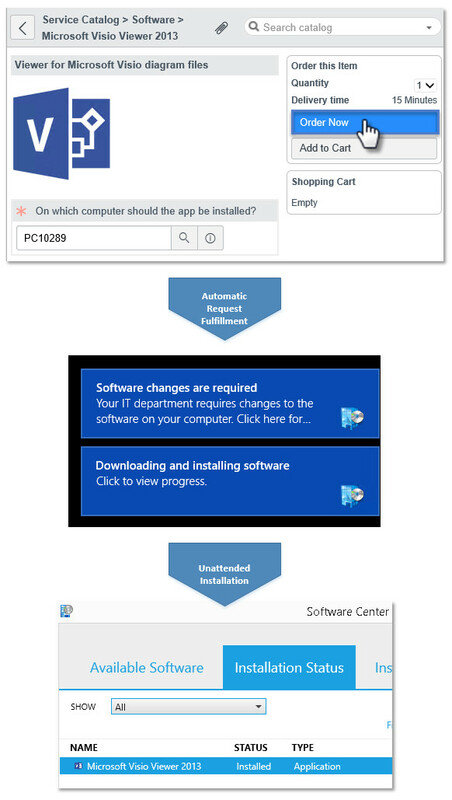 The Software Deployment - ConfigMgr app provides a simplified architecture that provides a one-click method of directly connecting ServiceNow to Configuration Manager without any installation or additional infrastructure. Once the connection is in place, the existing software library defined in Configuration Manager is imported directly into ServiceNow's software catalog, where each of the items appears as an available item for automatic deployment. There is nothing to change and no impact to your existing Configuration Manager infrastructure and software library. Application and package deployments and collections are used as already configured. For software items with multiple deployment types, simply choose the one to be used when requested via ServiceNow. Your Configuration Manager software library is imported directly into ServiceNow and exposed through the self-service software catalog. It’s easy to see the benefit of eliminating the support burden of fulfilling software requests, but it’s equally if not more important to recognize how a controlled self-service strategy for software delivery can impact security in a big way. That’s because software installation is a primary driver for arguably the most significant risk factor in the enterprise, which is enabling local administrator privileges for end users. Many organizations do this with good intent: they don’t want users hampered by delays in getting software and therefore let them do it themselves. But this opens up a fundamentally larger attack surface on the user's device and enables a vastly broader array of attacks that could not succeed against a user running with standard privileges. Indeed, analysis suggests a large portion of attacks can be mitigated simply by removing administrator rights. Fortunately, System Center Configuration Manager provides a mechanism for software installation from a secure, vetted internal source using a protected system service. This gets end users out of the business of installing apps and thereby out of the risky business of administering their own devices. ServiceNow customers love its integrated reporting and dashboard capabilities. This app takes full advantage, providing an at-a-glance dashboard for how software deployment to users is functioning in your environment. Several reports are included out of the box to provide a quick look at software request trends -- what is your most popular app, and how often is it being requested? We can help add custom reports for your specific needs. Maintain a firm grasp on software licensing costs while simplifying the processes for approvals and associated record keeping. As a ServiceNow app, this integration takes advantage of the platform's workflow automation to move a request quickly through any required approvals on its way to the end user while providing rich context to the approver. The access control mechanism of the ServiceNow service catalog allows precise targeting of software to users, ensuring they only see the apps that are relevant and accessible to them based on any combination of criteria including role, title, and location. Notifications are also an important aspect of successful self-service. Give your users timely and rich notifications that help them understand the status of their software requests and guide them through any supplemental setup tasks once their app is installed. Apps will usually install without issue, freeing the support staff from dealing with the burden of related requests. If installation happens to fail, an incident will be generated automatically with all known error information included. No user action is required and support technicians will have a head start on troubleshooting using their standard incident resolution process within ServiceNow. Integrations need to be more than just functional: they should be reliable and easy to maintain. Our philosophy is to design for simplicity, opting for minimal added requirements and as few breakable components as possible. ServiceNow already provides the infrastructure for maintaining a reliable, highly-available, and monitored connection to your datacenter: the MID server. We add only a lightweight connector that serves as a translator between ServiceNow and SCCM, executing the requested commands quickly and efficiently against your Configuration Manager infrastructure. There are zero requirements for additional databases or servers in your environment. There are no reminders to set for the admin team to check on service health or worry about resource conflicts. Just drop the connector in place and the integration lights up. How does this approach compare to using the Application Catalog website included with System Center Configuration Manager 2012? The application catalog provided out of the box with Configuration Manager is functional but suffers from being an isolated tool. Users have to find and navigate to a different website with a different look and feel from the organization's intranet (the Application Catalog styling cannot be customized). Within the tool, the approval mechanism is isolated and requires console access to manage, making it impractical for real-world use by managers and support staff. Installation failures happen silently, waiting for the user to complain or a sysadmin to notice. This integration places all the approval, reporting and notification functionality inside ServiceNow where it can work seamlessly with the organization's normal processes and data. It also places the user interface directly alongside the rest of the content of their normal portal experience, allowing them to easily find and install software with little confusion. Configuration Manager handles what it does best (deploying the software itself) and leaves the rest of the business processing to ServiceNow where it has the most utility. Moreover, the Software Catalog can be fully customized in ServiceNow, providing the flexibility to establish and evolve a modern interface as the platform and technology improve. Does the integration require modifying our Configuration Manager infrastructure? No. The integration only requires a user account with limited access to read the software deployment configuration in Configuration Manager and to make collection updates to fulfill user requests. There is nothing to install and no further configuration changes required. Just set up your applications and packages for deployment in the standard way and one-click import into the ServiceNow app to expose to users as available catalog items. Do we need System Center Orchestrator or another automation platform to enable the integration? No. The integration was designed specifically to be direct and lightweight, with no third-party infrastructure required. Just drop the connector file onto your MID server and grant the MID service account appropriate access to Configuration Manager. Discovery and deployment commands will then issue directly from ServiceNow to Configuration Manager through the security of the MID server as a proxy. Is there an approval mechanism to control software requests? How are they configured? Absolutely. This is where ServiceNow shines: any approval workflows configured for your Service Catalog will apply to software requests using the native approval functionality. You can configure the workflow for Service Requests to trigger approval for a certain price threshold or a user's department, for example, and route the approval accordingly. Only once approved will the software delivery proceed. Do my Configuration Manager admins need to become ServiceNow admins to implement and manage this? Not at all. The integration is very careful to play nice with existing software deployment configuration and simply imports the collections, deployments, applications and packages that are configured via the Configuration Manager console by your team today. The applications and packages then appear in the ServiceNow software catalog as deployable items. How is this different from the "Microsoft SCCM" integration/plugin available from ServiceNow? The ServiceNow-provided plugin "Microsoft SCCM" is an import-only (to ServiceNow) integration for discovering a subset of the data in the Configuration Manager database. It does not deal with software deployment or provide any action-oriented functionality. 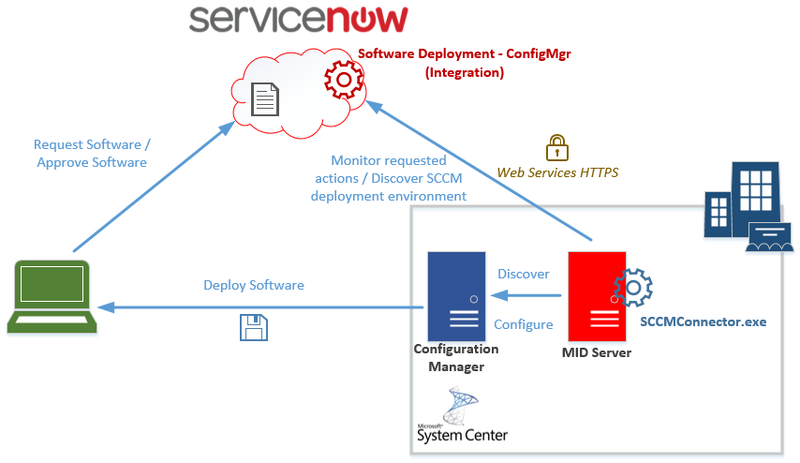 The Software Deployment - ConfigMgr integration can coexist with the ServiceNow plugin and provides a two-way connection for self-service software deployment functionality. Is the integration supported and certified? Yes. The app is fully supported and we'll work with your ServiceNow and System Center teams to get it set up. The app has also completed the thorough review process by ServiceNow engineers and conforms to all best practices for performance, security and management, and has been granted ServiceNow Certified status. What level of effort is required for implementation? Assuming you have Configuration Manager in place already with some software deployed, the integration from ServiceNow is very straightforward. Once the app is installed from the ServiceNow Store and the connector files placed on the MID server, the app can quickly discover all the data it needs to begin immediately providing the software catalog to users. The integration is competitively priced and designed to offer significant savings as compared to custom integrations or other solutions. Pricing is offered at a flat monthly rate and invoiced through ServiceNow using your existing subscription relationship -- no additional billing relationship needed. Yes! We'd be happy to help you get this up and running in your environment to kick the tires at no cost. What if there's a feature missing? The app is being actively developed and the roadmap is directly determined by customers. Have something you want to see? Let us know -- chances are, we can make it happen. To try it out or to learn more, you can simply get in touch. You can also click the link below to view the app in the ServiceNow Store, where there is a "Contact Seller" button that gets the ball rolling.